Just a short note to thank you for the quick response to help resolve the problem we had at Wetherby WwTW with the outfall pumping station weir. Your assistance in the production of the Method Statement and Risk Assessment was much appreciated. Your operatives worked well in a difficult environment and have left a nice clean and tidy opening in the weir as requested. We were confident that Condor Projects would deliver the engineering solution required and we were not disappointed. 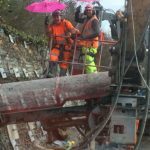 We have been extremely impressed with Condor Projects pile cutter. The machine has delivered all that Condor Projects said it would do, and more. We’ve seen safe cutting to excellent accuracy and reducing time on the job by fantastic margins. We’re sure to use it again. Condor Projects were employed at our Tesco refurbishment project in Coventry initially to carry out floor planning works to remove the existing floor finishes. 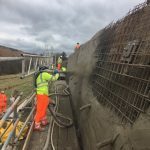 Thanks to their no nonsense approach to the works and friendly management team this package was soon varied to cover other works such asconcrete cutting, drilling and demolition. Martyn with his team brought a fresh, dynamic approach to problems and provided us with cost and time savings through their innovative solutions. A job well done!! Condor was asked to undertake a difficult task that had further demands added just at the start of the programmed works. However, it is my opinion that Condor was successful in delivering this piece of work to a high level performance standard. We have no reservations in recommending your method for soil nails and masonry anchors using the 32mm hollow GRP bar. We have found they meet our specification for ‘Cintec’ anchors but are much cheaper and are exceptionally easier to use and adapt. Indeed we have had issues with Cintec where any change on site has meant the bars being returned to Cintec to be adapted at an extra cost and delay. We have used them on numerous occasions including listed bridges and report no issues have ever arisen to give us reason to reconsider your proposals.